by J Michael Waller, Insight, August 5, 2002. Totalitarian regimes in the Middle East have targeted the United States with a well-financed influence campaign that is being rooted in American politics. Veteran watchers of the “active-measures” programs of the former Soviet Union say this Islamist propaganda offensive bears an uncanny resemblance to the old Soviet international front operations and the broad parade of fellow travelers who used themes of peace, tolerance and civil liberties to advance Soviet strategic goals by weakening the United States at home and abroad. “Active measures” is a translation of aktivniye meropriyatya, a term of KGB tradecraft that spans the covert-action spectrum from disinformation and propaganda to assassination and sponsorship of terrorism. The U.S. government had a means of predicting, identifying and countering Soviet active measures both at home and abroad. But it is poorly equipped to deal with Saudi-sponsored (and smaller, noncentralized) political- influence operations of militant Islamists against U.S. interests overseas and against the public and decisionmakers domestically. Cold War concerns at least led U.S. officials to focus on Soviet fronts and covert operations, but little notice was taken of the Islamist propaganda development that began in the early 1960s. Now, with the Soviet Union long gone and the information revolution having empowered small, decentralized groups to battle the United States with methods short of all-out military warfare, researchers at the Rand Corporation’s National Security Research Division have taken the lead in defining a new phenomenon they call “netwar.” Rand’s John Arquilla and David Ronfeldt, who coined the term “cyberwar” to discuss the military implications of the information revolution on warfare, also have coined the word “netwar” to define conflicts short of war involving actors who might or might not be military or even government. Netwar’s distinguishing element, they write in their new book, Networks and Netwars: The Future of Terror, Crime and Militancy, takes advantage of the information revolution to empower small, networked organizations to battle hierarchical governments. Netwar, according to Arquilla and Ronfeldt, is “an emerging mode of conflict (and crime) at societal levels, short of traditional military warfare, in which the protagonists use network forms of organization and related doctrines, strategies and technologies attuned to the information age. “These protagonists are likely to consist of dispersed organizations, small groups and individuals who communicate, coordinate and conduct their campaigns in an Internetted matter, often without a precise central command.” The United States barely is beginning to grapple with the problem, intelligence sources say. In its heyday, according to a CIA estimate provided to Congress, the Soviet Union spent an estimated $3.3 billion annually on active measures, including the Izvestiya, Pravda, New Times, Novosti and Tass propaganda vehicles; Radio Moscow and clandestine radio stations around the world; international Communist parties; more than a dozen international front organizations such as the World Peace Council; and the KGB’s entire operating budget for foreign rezidentura outposts. The budget included support for guerrilla and terrorist organizations. The Saudis are outspending the former Soviet Union in their worldwide influence operations, and much of that money has been spent in the United States, intelligence officials claim. At one point in the 1990s, some $1.85 billion was funneled through a single reputed Saudi front group in Northern Virginia, the SAAR Foundation, to fund Islamist activity, according to SAAR documents reviewed by Insight. Raided by federal agents for suspected terrorist money laundering and now closed, the SAAR Foundation was part of a network of Wahhabi-sponsored political front groups, mosques, charities, educational foundations, youth and student organizations, investment firms and holding companies. Many currently are under federal investigation as part of the Treasury Department’s Operation Green Quest to track down alleged terrorist money. “Kennedy made it very clear that merely carrying out instructions of a foreign intelligence officer in support of a political objective would not be ‘covered’ under the law,” according to Herbert Romerstein, a former professional investigator with the House Permanent Select Committee on Intelligence. “That loophole remains in the USA PATRIOT Act,” passed after the Sept. 11 attacks as a tough new legal tool to fight terrorism, Romerstein says. Many of these active-measures operations reportedly are run through mosques, where they are not subject to IRS reporting requirements and until passage of the USA PATRIOT Act last autumn were practically off- limits to the FBI. Federal authorities raided or shut down at least 17 of the organizations for alleged financial improprieties since Sept. 11. All the affected organizations maintain their innocence. Recent years have seen a merger between some old Soviet front organizations and left-wing activist groups and Islamic terrorist causes. The New York-based National Lawyers Guild (NLG) — officially cited as having been created in the 1930s under Josef Stalin as the foremost legal bulwark for the Communist Party U.S.A., its fronts and controlled organizations — survived its Soviet sponsors and now is considered by national-security specialists to be the main legal group facilitating terrorists and related causes. 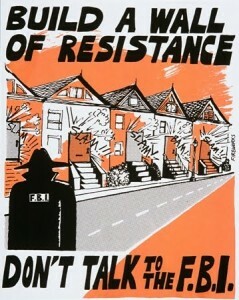 Among its projects, the NLG has published brochures advising people how to stand up to the FBI if questioned in terrorist cases. The brochure is available on the NLG Website in several languages, including Arabic, Farsi and Punjabi. The NLG leadership runs the day-to-day operations of another group, the National Coalition to Protect Political Freedom (NCPPF), founded in the 1960s to provide legal support for domestic terrorist groups such as the Weather Underground, Symbionese Liberation Army, Black Liberation Army and Puerto Rican Armed Forces of National Liberation (see “Domestic Front in the War on Terror,” Jan. 7). The NLG, NCPPF and other reputedly Marxist operations of long-standing, such as the Center for Constitutional Rights (CCR), defend their clients as being unjustly accused, condemned through guilt by association or simply as misunderstood individuals whose politically unpopular views and actions must be protected under the Constitution. Critics of their clients, as well as law-enforcement agencies and anyone else acting against them, are labeled “racists and bigots” — now favorite terms of agents of the Wahhabi netwar. This apparently is a 21st century adaptation of defense tactics that have served Soviet operatives well since the 1940s. “Like the Communists before them, the Wahhabis have presented arrestees, detainees and indicted suspects as people persecuted because they are ‘foreign-born’ or victims of ‘ethnic profiling,’” says Schwartz. With no other government agency taking the lead, the Pentagon created an Office of Strategic Influence (OSI) that would, in part, wage the war of ideas in the Muslim world. Insight sources alleged Department of Defense (DoD) spokeswoman Torie Clarke covertly wrecked the OSI by leaking disinformation about the office’s mission to the New York Times in February, leaving the government without a single tool for strategic- influence campaigns abroad. Clarke has refused to respond to Insight‘s many offers to allow her to refute these charges. Looking back on the USIA Office to Counter Soviet Active Measures, Romerstein notes, “We don’t have an apparatus now to counter the lies being spread by America’s enemies in the Arab world.” In fact, the United States has nothing in place to do this at home. FBI Director Robert Mueller heaped praise on those Muslims in America who have helped the bureau crack down on domestic and foreign terrorist groups — but what he didn’t say was more revealing. In the week prior to the speech, various TV personalities, including MSNBC’s Alan Keyes and Fox News’ Bill O’Reilly, tried to get AMC Executive Director Eric Vickers to denounce terrorist organizations such as Hamas, Hezbollah and al-Qaeda. While denouncing acts of terrorism, Vickers avoided denouncing these notorious terrorist groups themselves. — Ibrahim Hooper, director of communications, Council on American-Islamic Relations. — The American Muslim Council’s Abdurahman Alamoudi.